Cities are full of paradoxes—like that they are both unique and universal. So it makes sense our own work to elevate & connect them would present some tricky questions, too. Questions like: How can we grow responsibly in places where we are new? And how can we keep our door open to as diverse an audience as possible, and not become an exclusive club for a fortunate few? These are the kinds of things we think about—on top of the everyday thinking about the "who" and "what" to amplify in the cities of Detroit, Philadelphia & New Orleans. Do we like the idea of a Consulate in every city? Yes, of course. Will we enter a new place uninvited? Nope. From the moment we launched, we received so many lovely messages and tweets from Baltimore to St. Louis to Memphis to Los Angeles, all asking what it would take to open a Consulate in their city. We were flattered. We were excited! We got wide eyes & butterflies, the way new ideas & projects do. Should we have leapt? Maybe. In retrospect, we're glad we didn't. If we had grown too soon, we would have tripped over ourselves, no question about it. Here's the truth: We weren't ready. We needed time to test & refine the idea, to figure out our strengths & weakness. We didn't know which programs would work, and which would fall flat, and what we might be missing. We also needed a stronger sense of not just who we are—but what we're not, and what others might do better. We are deeply grateful for Knight Foundation's support of this initial pilot period to watch, listen, experiment & learn. We understand this kind of opportunity is rare. We don't take it for granted. Thank you to Alberto, Carol, George, Katy & Patrick for trusting us to test, refine and where necessary, shift. "Allow events to change you. You have to be willing to grow. The prerequisites for growth: the openness to experience events and the willingness to be changed by them." The Consulate is not the same today as the concept we pitched to the Knight Cities Challenge in November 2014. Barack Obama was president. The Paris Agreement was being negotiated. The opening of Cuba was on someone's to-do list. Theaster Gates had yet to give his TED talk or release his principles for ethical redevelopment. Black Lives Matter was a young hashtag, too. It would be another eight months before Donald Trump descended a gold escalator to announce his candidacy and declare that "the American Dream is dead." The world has changed since we hatched this. "The Consulate is a network of storefront 'salons' for urban dwellers & travelers seeking cross-city cultural and civic exchange. Starting with three cities (Detroit, New Orleans, Philly), The Consulate offers visiting guests an entree into local culture, and offers local residents exposure to people & ideas from other cities. In the tradition of foreign embassies (but less grand, more inclusive), The Consulate curates revolving talks, exhibits, screenings, pop-up dinners & more to showcase great minds shaping American culture. On any given evening, you might find an architect presenting plans, or a designer introducing a new collection, or a journalist hosting a conversation—all in an intimate setting, with online content to help ideas travel beyond the four walls. Imagine Gertrude Stein's parlor meets a Monocle storefront—a 'safe space' for provocative ideas shaping urban life in the 21st century." Not too far off. The essence is the same. The need, however, has changed. "____________________. Intentionally left blank. Allow space for the ideas you haven’t had yet, and for the ideas of others." From the start, we had a pretty clear vision of the look & feel of a Consulate space, and what kinds of things might happen there. Then we started asking more questions & listening for advice. Through dozens of long conversations with thoughtful urban friends & advisors across the country, certain elements came to the fore—and others fell away. "To grow up in Detroit was to get an incredible education in Black Arts & Letters..."
This line stuck in our minds something fierce. David wasn't alone. 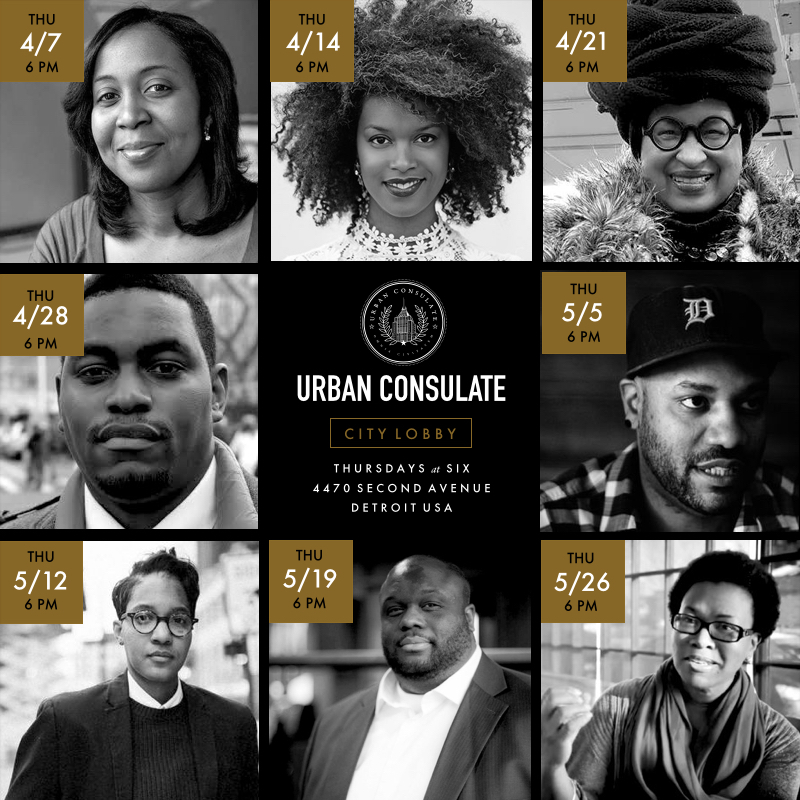 Many echoed the concern that with all the new Detroit 2.0 investment & development, the Consulate could help balance that out with a different energy—a return to what makes Detroit really cool. Black culture. Urban intelligensia. Community ingenuity. At the same time, the national landscape was shifting. As the presidential campaign heated up, and the rhetoric grew more polarized and racialized, the need for more conversations across difference was clear. "The most important thing in all human relationships is conversation, but people don't talk anymore..."
Maybe we could help with that? So maybe we wouldn't be the best venue for dialogue across urban/rural divides. Or conservative/liberal divides. Our guests would be largely—entirely?—progressive city people. But we couldn't not address other obvious fissures across race, class, gender & identity. So this became a core part of our programming—conversations about how to live together in difference. Which really, when you think about it, is what cities are quintessentially about. "People don't talk anymore, they don't sit down to talk and listen. They go to the cinema, watch television, listen to the radio, read books, update their status on the internet, but they almost never talk. If we want to change the world, we have to go back to a time when warriors would gather around a fire and tell stories." In April 2016, we got off & running. And for our first series of parlor talks in Detroit, we decided to try something new. Instead of telling people what to talk about—dictating a topic, like a panel discussion—we asked guest speakers to pose their own daring questions. The more bold & provocative, the better. Since then, we've hosted over 150 conversations for 5,000 guests across 3 cities in all styles & formats—parlor talks, dinner & dialogues, tea & wine tastings, film screenings, an urbanism book club, Jane's Walks, James Baldwin Hour, cross-city fieldtrips & exchanges, video & podcast recording sessions, focus groups & workshops, co-working hours, civic group meetings & more. We've welcomed famous national thought leaders, and almost-famous local ones. We've popped up in storefront cafes for neighborhood conversations, and we've met outside in public parks. We once hosted a Connect Four tournament & turned our front porch into a music stage. We've learned: Any Consulate program *must* be hosted by a local leader with deep community roots and knowledge—as well as a curiosity to learn from other places. We've learned: The right host is even more essential than the right space. We started the other way around, but we know better now. We've learned: Urban diplomacy and exchange requires great intentionality, sensitivity and trust. Especially when we're talking about cities experiencing growth pains—which is every city, really. We've learned: Our local speakers & topics are often most popular. We thought our conversations might be driven more by visiting guests from other cities, but it's more often the other way around. We've learned: People are eager to dive into local challenges as well as solutions & opportunities. Even tourists, visitors, commuters & newcomers—they want to hear the real local conversations. We shouldn't underestimate people's capacity to see the struggles and still hold great love and excitement for a place. People want to be both challenged & inspired. We've learned: Our most engaging and transformative conversations are about places navigating change. We've found a great need and interest for safe "neutral" spaces to come together to talk, think, listen & question, hear different perspectives and imagine new possibilities. We've learned: Sometimes economic development leaders are nervous more talking will turn into unproductive "airing of grievances"—and we totally get why. But here's our experience: What can appear "negative" is often quite the opposite. It is a sign of life, of passion, of energy and agency, of pride of place. Frustration means people care. And have hope it can change. We've learned: People who seek out our programs are not complainers. They are critical thinkers. They are smart and curious. They see alternative ways of doing things, and they want to be a part of creating more inclusive, equitable & democratic places for all. We've learned: By creating an environment that is more social & intellectual than corporate or institutional, we can set a tone and atmosphere for more elevated conversations. Even seemingly small details like a fireplace, a library, a globe, a comfortable chair—they can help make weighty civic matters more inviting, not a dreaded obligation. We've learned: That by encouraging our guests to pose their own daring questions—instead of simply slotting them into panel discussions on pre-determined topics—we can can get some really bold & interesting ideas flowing. And our guests become the co-designers of our programming. We've learned: There is always more need to teach and practice humility, empathy & civility. We are learning ourselves through practice how to better facilitate & moderate dialogues that show this. We are committed to getting better and are up for the task.